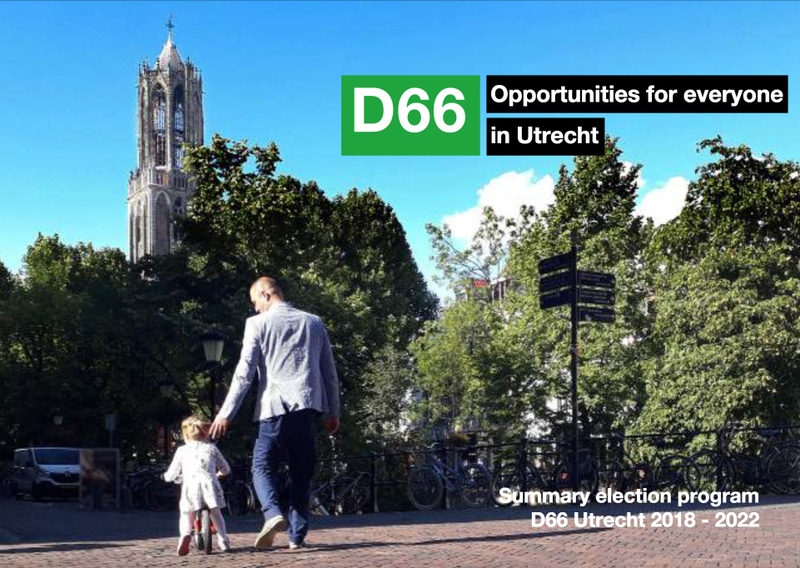 D66 Utrecht is a local branch of the national political party D66. Politically, we consider ourselves liberal-democrats: we are internationally-minded, socially progressive and environmentally conscious. It is our ambition to make Utrecht a place of opportunity for everyone. You are warmly invited to join us in this effort. D66 Utrecht is well represented in our city’s municipal council. Here, we have a rich record of progressive local policy initiatives. We constantly strive to innovate our democracy so that our city remains an inclusive place in which our diverse population can enjoy its life to the fullest. Although our elected representatives make it possible for us to affect policy, our ability to do so relies on a large body of passionate members, volunteers and supporters. This page is designed to give you an idea of who we are and what we do to make Utrecht a place that enables opportunities for everyone. Click here to open the English summary of our programme “Opportunities for all Utrechters” for 2018 – 2022. Should you have any further questions about municipal elections or about D66, whether it is about our guiding principles or specific positions, please do not hesitate to contact us. All of our staff and councillors speak English and are happy to help you with any questions you might have.